Cavanaugh: Did Anthony Nelson do enough at the combine to get the Cowboys attention? I​ hope​ everyone enjoys having​ Amari Cooper on the team. 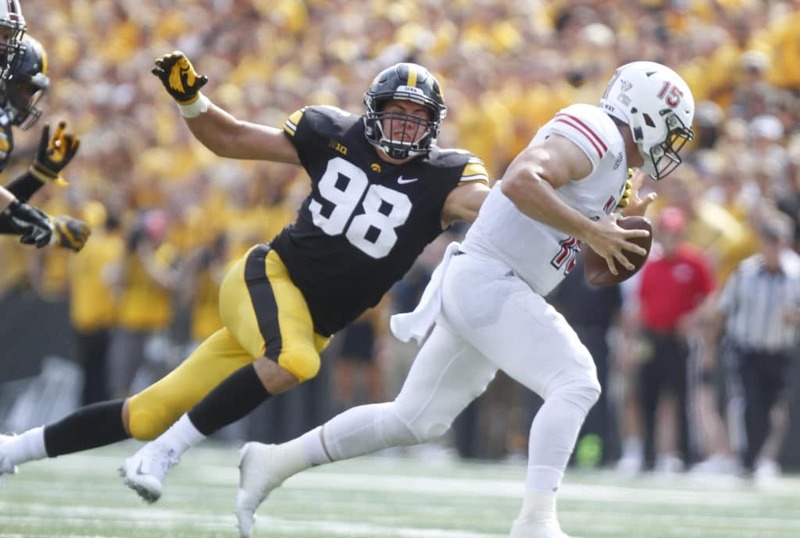 It’s​ all his fault that over the next few weeks​​ I’ll be profiling a lot of defensive linemen that the Cowboys could potentially target and none of them will be Quinnen Williams, Nick Bosa, Josh Allen, Montez Sweat and on and on. Without a first-round pick by the Cowboys, I want to give a glimpse of the names that could be realistic when Dallas’s first pick comes after 57 other players have been selected. That’s a pair of safeties, a defensive tackle and a defensive end. As we continue to get more names it’ll help us focus on the proper positions and potential fits for Dallas. What happens with the potential acquisition of Robert Quinn or the potential long term contract (or maybe even trade?) of DeMarcus Lawrence could certainly affect this at any moment. Take a look at this chart. 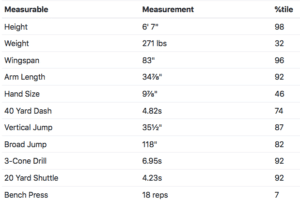 What you have is all the measurements from the combine and how that stacks up to other defensive line prospects over the years. Nelson’s athletic profile is outstanding. To be able to run the 3-cone drill in under seven seconds as a 6’7″, 271 pounder is awesome. Combine that with the jumps (which tell us how explosive a player’s lower body is) and arm length and you have the beginnings of a really promising NFL prospect. You’re not going to be able to ding him for his production numbers either. They’re not elite but they’re rock solid. Last year Nelson had 9.5 sacks and 13.5 tackles for loss. All of that is well and good. It’s also not nearly as important as how well a prospect plays football. To the tape we go. He will be the left defensive end on every play I show you. This is what we call length. You’ll hear coaches and front office folks talk about length all the time when they discuss defensive linemen. The poor right tackle can’t even reach Nelson to try to block him. All he can do is try to back up as slowly as possible. That’s 6’7″ with almost 35″ arms fully extended, playing with proper forward lean that’s going to make it tough for most blockers to be able to get their hands into his chest. The two clips we’ve seen are the beginnings of a useful NFL pass rusher. Being able to play with a good forward lean and quality extension as a big guy can help you bull rush. Flashing the ability to push-pull like this and slingshot your way by a blocker is a nice secondary tool to have in the bag. On this play he gets a really nice jump off the snap of the ball and has enough initial quickness to win inside on the tackle and disrupt the pocket enough to get a teammate a sack. The subtle thing to notice here is that his initial two steps are threatening the outside shoulder of the offensive tackle before Nelson dives back inside to beat him. This stunt isn’t even designed to get him to the quarterback, it’s designed to occupy blockers so No. 40 can swing around and hopefully be the free man. He just happens to get off the ball well enough and play with a nice pad level that makes it hard for the guard to pick him up. This is where we see the 3-cone drill on display a little bit. With his long limbs, it’s supposed to be a little bit of a challenge to change direction and pursue. The end result of the play certainly isn’t a positive for his team but that ability to redirect and chase after the ball is pretty rare for a guy so tall. Here that same ability to hit the brakes and explode in the other direction helps get him a piece of a sack. Too often he gets hung up on blocks. The flashes where he uses his length well and wins with hand placement are encouraging but it needs to be more consistent. Also, he needs to get stronger. Once he’s engaged or cut off by an inside blocker on a run away from him, he needs to be able to shed that blocker. For a guy with the measurable athleticism that he has, he doesn’t win the corner against blockers with bend. His 3-cone time hints that the ability is in there for it to happen, it’s not on tape often. Against the run he needs to more consistently be able to anchor against offensive tackles. If a defensive end has great tape, great measurables and great production, he gets picked in the top ten of the draft. When we’re talking about picking players at 58 or 90 we’re looking for the best combination of what they’ve already shown and what they can be with NFL coaching. Nelson has pretty solid tape, solid production and great measurables. With natural progression with an NFL team, he can become a quality starter in the NFL by his second year. I’ve graded him as a third-round player and a name that’s certainly worth knowing for the Cowboys. I don't think he will go in the fourth round but who knows. Things happen on draft day that we don't expect. I think he will go second/third but I could be way off. 18 reps on bench is very sub-par for a big guy. Not that it's necessarily a red flag. But I would think that you're looking for good upper body strength in a lineman. He is extremely long. Those guys tend to struggle on the bench press. Long arms makes it a lot harder.